Nick Yungkit, also known as NYK in the music world, is a Sony Music singer-songwriter who hails from the humble suburban city of Subang Jaya. Best known for his single, FWB, the musician is fast leaving musical footprints not just in Malaysia but internationally as well. In fact, at the time of this interview, NYK had just gotten back from a recording session in Sweden. So there we were on a Saturday morning, tucking into some tapao-ed burgers as we pulled up by the side of the road in a local neighbourhood. Amidst fast food and warm sunlight against our skin, NYK spoke about his music career and more, in his sweet Habenero-coloured Volkswagen Beetle. 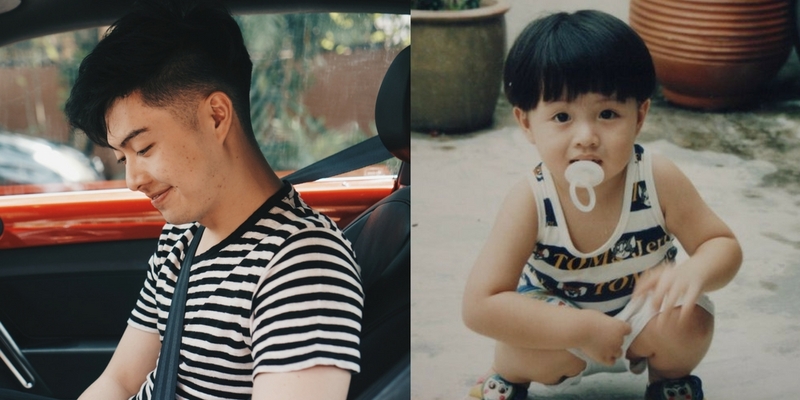 I was born in Penang in 1993; lived in Taiping and Ipoh for a bit before my dad got a job in KL, so we moved to Subang Jaya. There was a big move of people to Subang Jaya at the time. When I was born, my dad was just selling sweets in a van. We were dirt poor for a while. He went from that to being a life guard, and later a karate teacher. My parents had to worry about the next meal. From 9-5 he would be doing his sales job, and studied for his degree on the weekends, which was pretty badass. He finally got his degree and slowly rose up the ranks, and now he’s doing really well. I grew up in a typical Malaysian home, I went through Kebangsaan school all the way. I spent 3 years in Manchester, UK to study Economics, later did a Masters in Business in Monash University in Melbourne. And here we are. In between, I really just lightly dabbled in music. I’d join musicals and singing competitions, but nothing more. 2. What was your earliest memory of music? It’s quite typical to listen to what your dad listened to. And back then, my dad was into the whole AC/DC, Velvet Revolvers and Guns N’ Roses thing. I just fell hard for that. Plus, a lot of people in high school picked up the acoustic guitar and the electric guitar. And rock bands were a thing back then. In terms of music that I wanted to make, I was really inspired by FutureSex/LoveSounds by Justin Timberlake. And that was the point where my mind switched from being a listener to a maker. 3. Musically and lyrically, FWB is a bold move to make in Malaysia. What made you do it? I personally think that it’s time to break out of the mould. You could look at our cousins in Singapore, with The Sam Willows, Gentle Bones and Tabitha Nauser coming up. And in Indonesia, there are a lot of big acts as well. A lot of people around me have been doing it locally too. For example, Alextbh is a very good R&B producer, and he’s huge on Spotify. There’s Airliftz, he’s a rapper. In fact, he’ll be rapping on my second single. And these people are up and coming. I wanted to be a part of this wave. It’s a personal passion, I want to be able to show that you can start at home-ground making English music and you can make it out there. 4. What’s the process of songwriting like for you? I write all the time. I’d sit down with my friend Isaac, and we’d make demos together. And a lot of these demos don’t turn out to be songs at all. What happens is that Sony arranges sessions with a studio house called The Kennel which is in Sweden. They’d send me over and show them my demos. And if we all vibe with the demos, we’d turn them into songs. We’ve managed to come up with 4 songs in 2 days. 5. What helps you come up with song lyrics? Definitely my reading. I was such a bookworm, I still am. I’ve read since I was young. From Enid Blyton to Harry Potter and LOTR, to weird stuff like crime thrillers only your parents read. That gave me a lot of words to play with. I used to have a blog where I wrote short stories. So it was just a matter of turning it into lyrics. Having a good command of English is so important. It’s a struggle here in Malaysia. Even in my own marketing campaigns, I would see typos… Come on guys. 6. What was it like starting your music career in Malaysia? When I first got into the music scene, I was introduced by a few people who were in the indie scene for quite a long while, to playing in open mics. I did quite a few gigs and a few open mics, and I eventually got to know everyone in that scene, as it was a pretty small one. We were getting 20-30 people watching each show. I barely saw any new followers after them. Initially, I thought it was just that my originals weren’t great. But the more I was in it, the more disillusioned I got. The funniest part was that at open mics, you’d get the same people watching and clapping for the same people at every show, just different locations-Merdekarya, The Bee, and Laundry Bar at the Curve. I personally think that it wasn’t doing anything for the music scene, in fact it may be damaging the scene. So I left it. And then Sony approached me about FWB. They were scouting around for a local artist with an international sound in the SEA region, until they found a video of me singing FWB. That’s when I got signed on. 7. What’s your advice for people who want to make it in the music scene? Write good music, produce it. You can take Talitha Tan and Alextbh as perfect examples. They wrote good stuff, they got it produced, and they got it marketed. Alextbh has a huge LGBT following, Airliftz has Jin Hackman who has a large network as his producer, and Talitha positioned herself as an influencer. All of them have their own style, but they all made good music and had good marketing. If most musicians continue to stay in the open mic scene, the only people who are going to grow are the select few who actually produce music. The Malaysian music scene would then continue to be stagnant. Which would be really disappointing. 8. What did the people around you think about your music career when you started out? It was really annoying. Once I got more stable, signed a record deal and appeared on magazines, people were more accepting. They’d go “oh, yi si bing xing liao” (he’s a star now) and only now they’re okay with it. It helped that I didn’t intend to purely go into music. I’m planning to start work soon and I have a business that is in the works. So I’m not just a musician. I guess the boring business person in me just wants to diversify my risk. Music is still an irregular job. Unless you are really famous. I wouldn’t want to wait for that few gigs. 9. What’s the reality of chasing your passion? It might not pay as much as you think it would in the beginning. The only reason I’ve got less risk to deal with is because of my parents. If I had parents who weren’t as well-to-do, I think I have to really care about music before jumping into it. You owe a responsibility to take care of your parents at some point once they are less capable. The fact that they have been splurging all this money on you with no return, it’s not an investment. They just gave because they want you to do well. With that kind of backing, you have the responsibility to take care of them when they need your help. I’m lucky that I’ve got a comfortable home to live in, and I’m not paying rent. I have even more respect for people who aren’t well-to-do, but still choose to do it. That is assuming that they’d have plans for their parents in the future. If they go into it recklessly, and their parents aren’t doing well, I do question that. Make sure you’re there for your parents when they need you, both monetarily and physically. 10. Where do you see yourself moving forward? Definitely being a big presence in music and to work with the likes of 88rising, Joji, Rich Chigga, and Keith Ape. I’m a pessimistic guy, so I won’t put my hopes up there, but I’m definitely gonna work towards it. I won’t be discouraged by the fact that it’s not gonna happen. I’m still gonna try. I want to be that guy who people will say, ‘Oh that’s the guy who carried the Malaysian music scene on his back, along with Alex, Talitha, Airliftz and these other people’. To grow and nurture it and build it into a healthy music scene where people would pay for local music. Ultimately I want arts in Malaysia to be a thing. It’s getting there, slowly, but surely. More and more people are appreciating the arts. There will be a time where people will push for arts to go up there, and I want to contribute to that. Even if it means that I will be the guinea pig or case study for future artists in Malaysia.